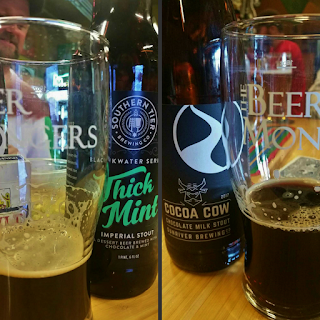 After last week's short two-beer list, this week we found a ton of delicious beers in our glass. We'd be remiss to cut it short so grab a beverage (a beer if you can) and settle in because there is a whole lotta stuff we're excited to tell you about. Starting off with the best of the best, it turns out all of these were enjoyed at our favorite haunt. As usual we opened and shared bottles (the good and the bad because it's only fair) with our friends and relished the reciprocation. Big thanks to Chris for the tasty treats below that he brought to our attention. 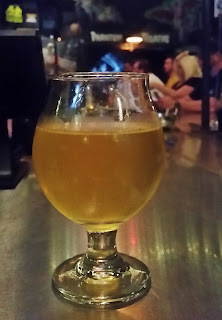 Holy Mountain The Grey Tower (Blend #3) - Described as a blended Saison, the aroma is more Brett than Saison (a happy turn of events for us) with the flavor being comprised mostly of oak, a bit of Brett and imperceptible Saison. It's a winning combo in our book. Almanac Blueberry Jack - This beer follows the trend of most of the Almanac beers we've had by being amazing. From the start with that gorgeous label this dry hopped and barrel aged fruit sour excited us. Upon opening cattiness was prevalent in the aroma but as it warmed both the aroma and flavor leaned more toward sour, much to our delight. The Libertine Wild IPA - The first beer we've had from this brewery, it is a great wild/open fermented IPA. Apparently it is heavily dry-hopped but done so in such a way that the aroma of the hops used is showcased rather than their bittering qualities and it really is the wildness that more pronounced than the hops. Works for us! Southern Tier Thick Mint - We've had plenty of Southern Tier's sticky sweet beers and while we enjoy them, they tend to be over the top. This one isn't as tooth achingly sweet and as expected it smells and tastes just like those iconic cookies. A great dessert beer for sure, if we had any of those cookies left we'd be interested to see what they taste like together. Would they clash? Would they be meh together? Would it blow our mind? Perhaps next year we'll find out. Sunriver Cocoa Cow - This was not the first time we'd had this beer but this time around we had it in a bottle instead of on draft. Some beers are significantly different between formats so maybe that's the reason why we enjoyed it even more this time. Maybe not. Maybe we'll have the opportunity to do a side-by-side sometime. In the meantime we'd be happy to have more of this chocolate-milk-meets-beer sweet stout. The second half of this week's round up rated only a teeny, tiny lower than the first half. They did however show more diversity both in style and in where we drank them, in case you think we don't get around ('cause we do). Little Beast Brewing Fera - Little Beast is the new brewery from Charles Porter, most recently at Logsdon, and last week they officially hit the scene at OP Wurst. A 100% Brett Saison, it is light and easy drinking on its own but also pairs wonderfully with cheese (see the big hunk below), our favorite beer pairing food. Matchless Voss IPA - This is one of those recently popular, hazy IPAs and as such, isn't much of a looker. 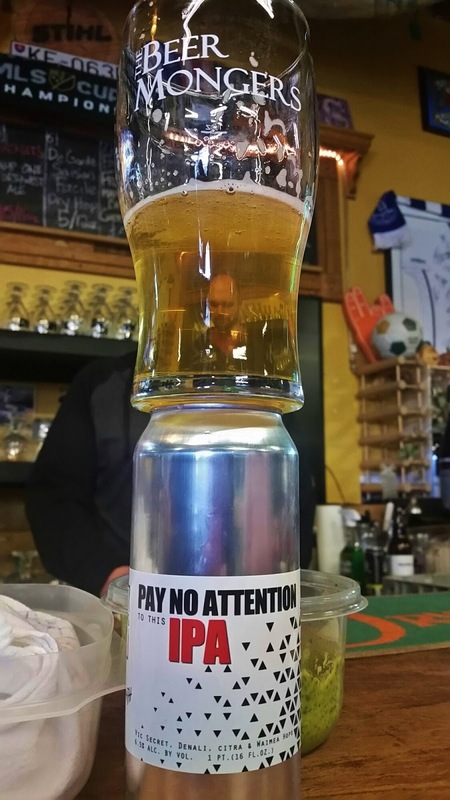 Ignoring that one finds a delicious grapefruit flavor from the Simcoe and Mosaic hops and Norse farmhouse yeast, the region which it hails from and the basis for the name of the beer. Samuel Smith's Organic Perry - There's plenty of Samuel Smith around currently due to a passport-style promotion meaning more than the usual availability. Similar to a cider, but using pears this has a bright, fruit aroma and a flavor that is of actual pears (as it should be) and not overly sweet. Pyramid H7 Unfiltered Imperial IPA - Sent to us by the good folks at Pyramid, it is part of their Brewer's Reserve series and uses seven hops - Apollo, Chinook, CTZ, Simcoe, Amarillo, El Dorado and Calypso - thus the name. Presenting with a rich copper color and a distintly boozy nose (no surprise for 9.5%), the flavor starts a bit harsh but mellows midway through, finishing with a nice hop hit. Block 15 Alpha Northwest-style IPA & Atmosphere Pale Ale - Both were enjoyed at The Hoppy Brewer during a Block 15 event and both are dry hopped. Perhaps less important in the IPA, it's that dry hopping that elevates the pale ale to what our hop-favoring taste buds desire. 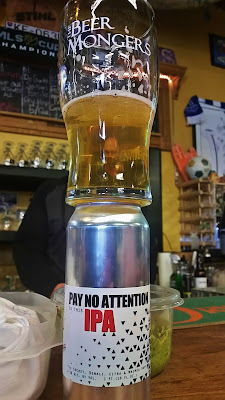 Loowit Lager - Lagers are a hard style to impress us but we have to congratulate Loowit for creating a straightforward, clean lager that will be something particularly refreshing this summer. Belching Beaver Peanut Butter Latte - This was a bit of a happy accident as we thought we were picking up a Belching Beaver beer Chris brought to our attention earlier. Turns out it was an IPA with a label similar in color that he was talking about but we were very pleased to find this to be super drinkable with a nice (not fake) peanut flavor that was mildly sweet. And clocking in at a mere 5%? Absolutely! Crooked Stave Serenata Notturna Blueberry - Belgian golden ales aren't generally in our wheelhouse but here the base beer contributes a hay-like (note, not manure-like which we do also enjoy) characteristic that in combination with the use of blueberries and the aging in oak barrels has created a super easy dranking (yes, not drinking) 12%. Proceed at your own risk with more than one bottle. Double Mountain Sweet Jane - It used to be that the biggest hits from Double Mountain were their fruit beers, which are amazing, but either the taste buds are a changing or perhaps they're dialing in their non-fruit recipes. This one, in addition to a beautiful, colorful label has a sweet aroma to begin and a somewhat sweet, but not cloying flavor. A very clean beer. Kudos to you if you made it all the way through this post in one sitting and/or actually read the whole thing instead of just skimming. We'll work on drinking less amazing beer this week so next week's post won't be such a tome (kidding...we'll drink as much yum as we can). 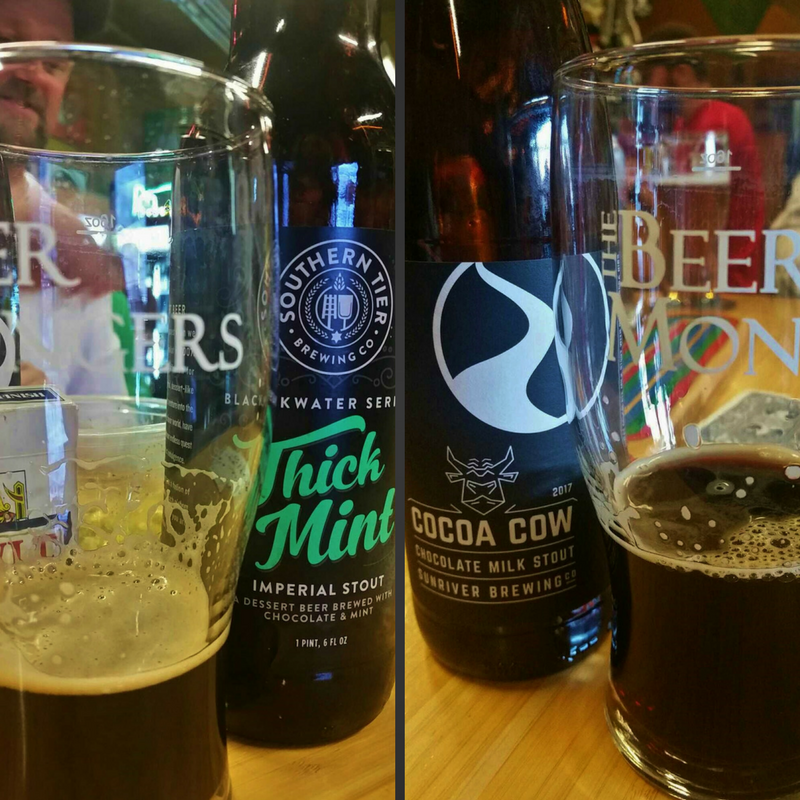 In reviewing our drinking last week it turns out that we had a lot of good beer, in fact so much that we decided to distill this post down to only the top two. Ruse 4th Kind - Ruse is one of those breweries that holds a special place in our hearts, in part because we got to know owner/brewer Shaun Kalis when interviewing him for a piece in the Oregon Beer Growler last year. His brewery is housed inside Culmination, where he is also part of their brewing staff. This Northeast-style oatmeal pale ale, brewed with lactose, is citrusy and juicy and hazy as one would expect for this style of beer we're seeing an abundance of lately. Certainly one of the best hazy beers we've had the pleasure of enjoying it is not "traditionally pretty" but it's so damn delicious it doesn't even matter. The Commons & Grains of Wrath Pay No Attention to This IPA - The collaboration beer, from another special-to-us brewery and a new-to-us brewery, is definitely something to pay attention to. Earlier this year The Commons brewed its first IPA which was delicious and showed that while they don't usually make this style they are more than capable of making a very good one. This time around they have surpassed the initial IPA bar they set for themselves and gotten us excited about future beers from Grains of Wrath, the Washington brewery from former Fat Head's brewer Mike Hunsaker. With so much hoppy yum-ness we know we'll be missing it once it's all been consumed but in the meantime we'll do our part to drink plenty of it. 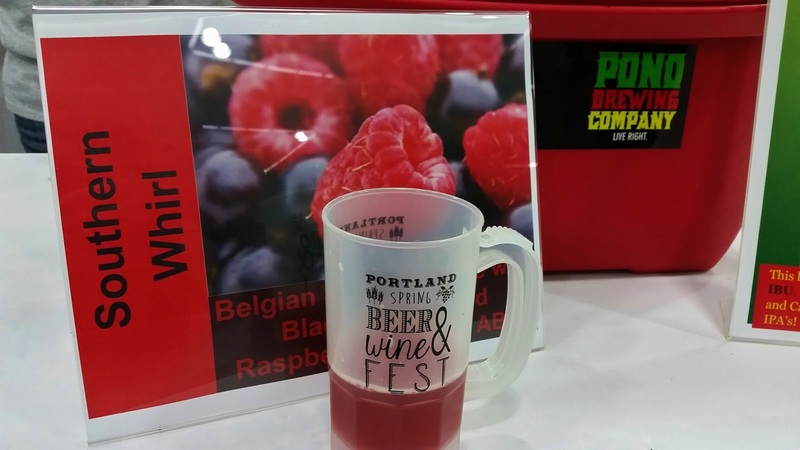 Yesterday the 2017 Portland Spring Beer & Wine Fest kicked off its two-day run at the Oregon Convention Center. 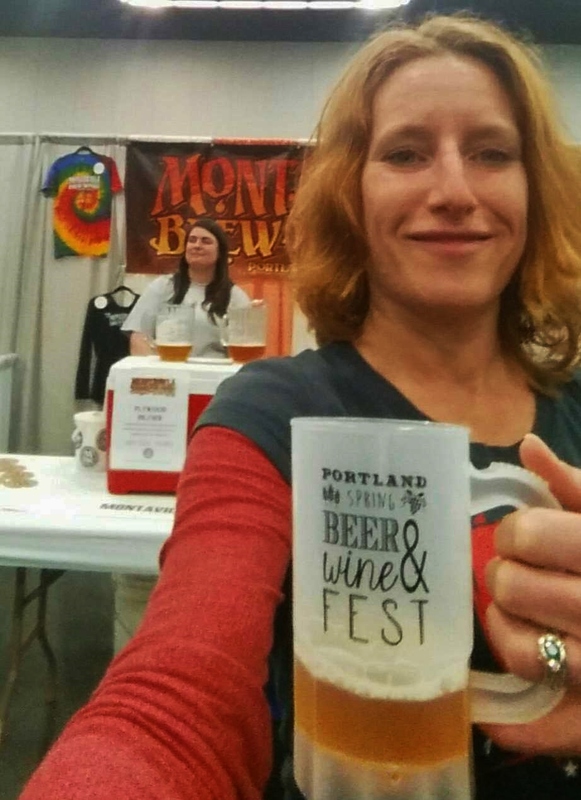 One of the few indoor only beer festivals, in addition to the beer and wine the name alludes to, there are also distilled spirits, food booths and something for just about everyone. Oh, and sugar gliders. We always find ourselves introduced to someone new when we attend this festival and this year was no different. One of those new-to-us folks was Bandon Rain cider. Located on the southern Oregon coast south of Coos Bay they are a family operation that started as a hobby. They brought to the festival their signature cranberry apple cider, Cranberry Squall, and Apple Pie. Both are semi-sweet ciders, at 6.7% and 6.9% respectively. Beyond being available in Bandon and Coos Bay, they currently are available in Eugene, Forest Grove and here in Portland at Bushwhacker Cider. Among those returning to the festival is Pono Brewing with two delicious and decidedly different offerings - Southern Whirl Belgian Strong Golden Ale with black currant and Oregon grown raspberries. 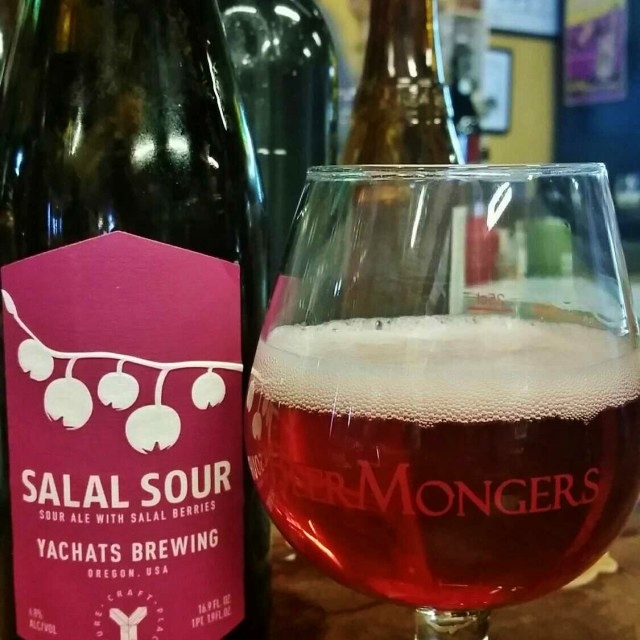 Gorgeous to behold, the berries temper the Belgian characteristics to make for a drinkable 8.14% beer. Their other offering, El Garrote IPA, sports a great caveman logo and "will knock you out." We'll be looking forward to seeing much more of this around town. Since we are hop heads, we can't overlook mentioning two other IPAs that we had for the first time at the Fest - Montavilla Citrasphere IPA and Modern Times Orderville. Citrasphere was the first beer in our glass yesterday and the lovely citrus aroma and flavor made for a great start to things. Shortly thereafter we had the dank-to-the-max Orderville. And while we won't go on and on about all the rest we drank and ate suffice it to say it was a very enjoyable time. The festival runs 12-10pm today and we'd recommend finding time to check it out yourself. 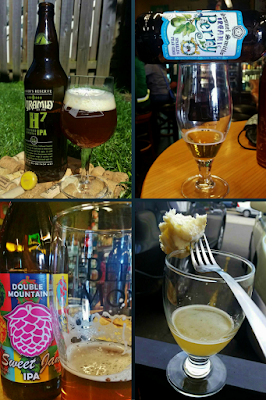 This week's Best Things is dominated by fruit but used in a variety of beer styles which kept things interesting (and pretty to boot). Yachats Salal Sour - Sitting at the top of the heap according to our taste buds is one of the first beers Yachats has bottled. 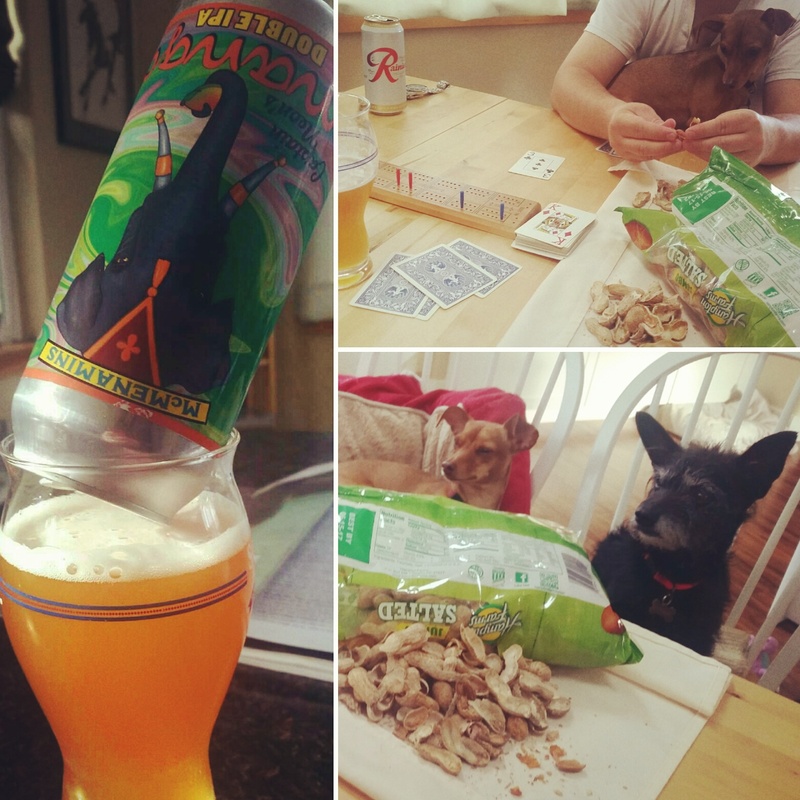 We've known Charlie and Jenna for awhile and are thrilled to see their beers making it up to Portland. 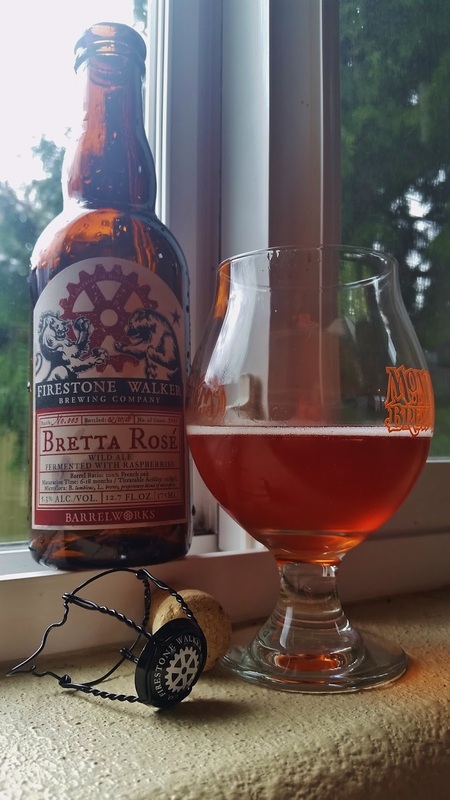 This one presents with a tart, fruity aroma and an absolutely gorgeous color. Made with local, wild salal berries (used by the indigenous people of Cascadia for generations) it is a clean, drinkable fruit sour. Keep 'em coming! StormBreaker Guava Man - "Don't judge a book by the cover" definitely applies to this beer. Looking like cloudy grapefruit juice the appearance belies the delicious flavor, which is in fact pithy as well as hoppy, that is found upon drinking it. North Coast Tart Cherry Berliner Weisse - We were surprised to see North Coast making this style of beer but couldn't pass up trying it. 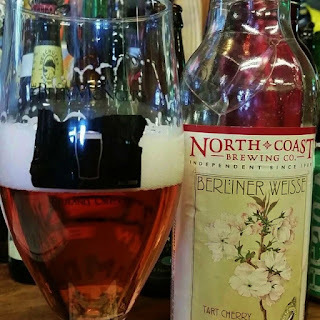 While we found it to be a bit on the sweet end of the fruit Berliner Weisse spectrum it was very drinkable with a real cherry flavor, the result of using real Michigan Montmorency cherries. Apparently it's a very limited release beer so if you're intrigued and see it you'd better grab it now or settle for regretting it later. Modern Times Black House Nitro w/Coffee, Coconut & Cocoa - A take on the brewery's oatmeal coffee stout, there is an impressive amount of flavor - mild coconut, coffee and hop bitterness - packed into its 5.8% ABV. We continue to be impressed with beer after beer from this brewery and are excited to have a newcomer that is so solid in our market. McMenamins Captain Neon's Mango Double IPA - We loved the colorful can artwork from first glance and were very pleased with the beer inside. At 9%+ ABV it's not surprising that the aroma is somewhat boozy. What may be surprising is that it doesn't drink that heavy. The combination of dry-hopping with Amarillo, Citra, Mosaic and Chinook and use of mango puree creates a yummy, hoppy flavor that may or may not have led to the consumption of multiple cans one evening (under the watchful eyes of Thing 1 and Thing 2). If you've had any of these beers we'd love to hear what you thought of them. And if you've had anything outstanding you think should be on our radar, let us know. 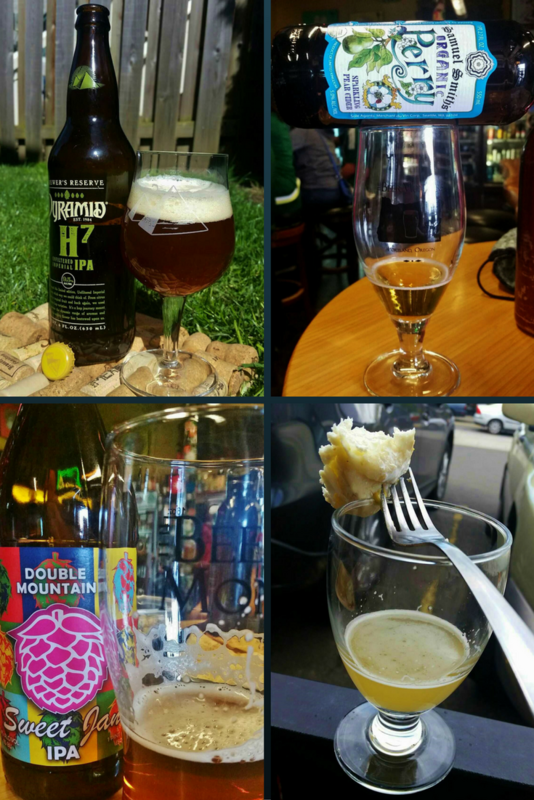 This week's best list is dominated by beers we consumed while taking a long weekend vacation to the Orange County, CA area. We drank plenty more than made the list (Portland still wins at beer) but there were definitely some remarkable beers had during the trip as well as some we had before we skipped town to soak up some much needed sun. Phantom Carriage Broadacres with Passionfruit - We get some Phantom Carriage in the Portland market and knew that they did a great job with sours so finding ourselves in the vicinity (Gardena, CA), we couldn't resist stopping. The brewery is unique, being part café and part haunted cellar (complete with horror movies playing) and overall damn cool. This was the best of the beers consumed there and sour to the max. The passion fruit used in this iteration of Broadacres gives it just enough mouthfeel to take some of the sour bite off. 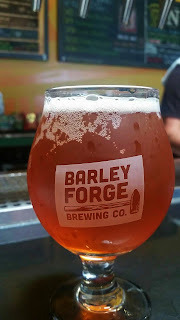 Barley Forge Wedding Tackle - Somewhat stumbling on this brewery (aka using a "search nearby" map function for breweries), we found ourselves surrounded by really great beer and a hopping taproom on a gorgeous Saturday afternoon. 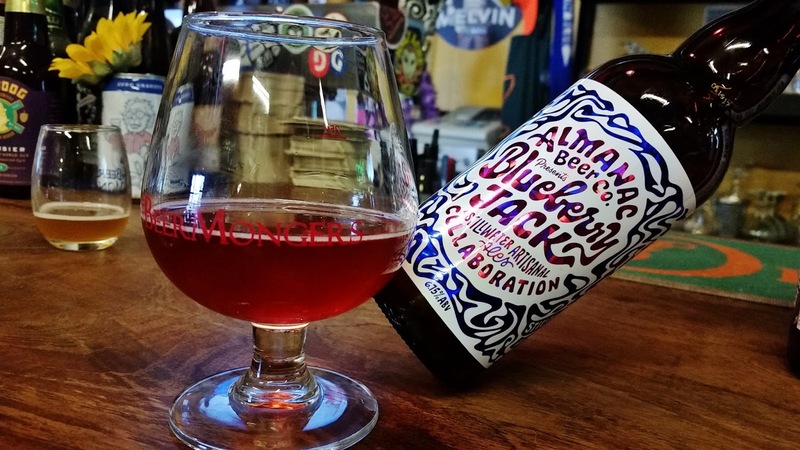 The huckleberries used in this sour blonde ale were present from the start - both in giving it a beautiful color and on the nose - and carried through to the flavor. The lightly, brightly sour flavor was enhanced by the cherry wood it was aged on. Barley Forge Nom Nom - We'd be hard pressed to pick a favorite between this hefeweizen and the sour, both incredible beers at easy drinking ABVs. A well crafted hefe, its classic characteristics are there and enhanced by the mango that was slightly present on the nose and more prevalent in the flavor. This is a very crushable beer that would be perfect for sunny, summer drinking. Block 15 Cosmic Cold Brew Double Ristretto - Block 15 does amazing stuff with hops but their coffee game is equally strong. Starting out with an aroma that is all coffee, followed by a smooth mouthfeel and finishes with a lovely lingering milked-coffee flavor. Firestone Walker Bretta Rose Batch 3 - A beer we'd had a year ago and thoroughly enjoyed, it seemed a great prelude to heading out to celebrate 14 years of wedded bliss. The extra year of age did nothing to diminish, and perhaps even enhanced, the tart, fruity yum that is so delicious. Honorable mentions go out to Stone for their Tangerine Express, enjoyed with breakfast on the first day of vacation at a sports bar, Tustin Brewing and Gunwhale Ales. If you find yourself in the area with limited time Barley Forge is definitely the place to hit. Gunwhale, a somewhat sterile feeling taproom, and Tustin, a neighborhood hangout filled with TVs for sports fans, are fine and we wouldn't steer you away from either, just keep in mind Barley Forge is where it's at in the Costa Mesa area.